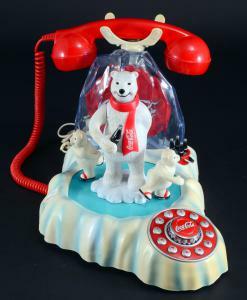 Coca-Cola animated polar bear phone, one of many Coke collectibles (and novelty phones) in the auction. 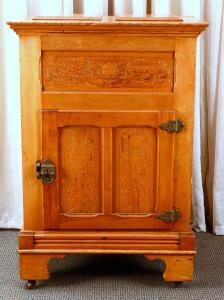 Very rare Amish oak ice box with liners and metal shelving, made in Pennsylvania. 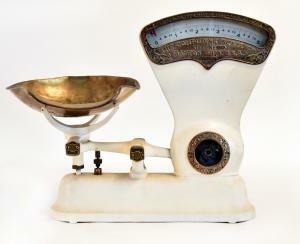 Beautiful candy computing weigh scale with attractive brass scoop. 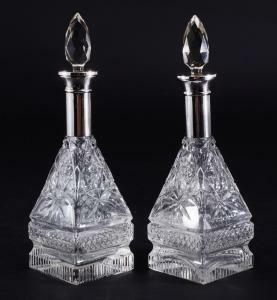 Pair of silver neck perfume bottles. Locking and talking vendor floor-standing toy dispenser on a metal platform, with a speaker and toys. They're items from the lifetime collections of Pat Bovard and Sherry Smithson of Lynn Haven, a suburb of Panama City, gathered over the course of decades. PANAMA CITY, FLORIDA, UNITED STATES, August 24, 2018 /EINPresswire.com/ — PANAMA CITY, Fla. – Items from the lifetime collections of Pat Bovard and Sherry Smithson of Lynn Haven, a suburb of Panama City – a massive accumulation of objects that began with a six-foot-tall Coca-Cola bottle and snowballed from there into thousands of collectibles in many categories – will come up for bid Saturday, September 22nd, at The Specialists of the South, Inc. The auction, packed with over 600 lots, will be held in The Specialists of the South’s gallery, located at 544 East 6th Street in Panama City, starting at 8 am Central time. Previews will be held the week of auction, from 9 am to 4 pm, and on auction day from 7 am until the start of sale at 8. For those unable to attend in person, online bidding will be facilitated by LiveAuctioneers.com and Invaluable.com. To say that Pat and Sherry are serious collectors doesn’t do justice to what is in their possession. Aside from the Coke collectibles (of which there are many), the pair also own a dazzling array of Roseville, breweriana, toys and toy trucks, advertising signs, advertising glasses, kitchen collectibles, clocks, telephones, trays, vintage hats and boxes, linens and embroidery, and more. It all began with Sherry, who grew up in rural Alabama and was visiting an uncle at his welding shop when she saw that he had a huge, six-foot-tall Coca-Cola bottle on display. She was so captivated by it he gave it to her (it’s not in the auction, by the way). And so began a serious Coke collection, later added to by Pat. The two met while both were teaching physical education in public schools and became instant kindred spirits – and collectors. They joined the Coca-Cola International Club in Atlanta and eventually traveled to every state in the country (always in the summer, when school was off), to find new additions to their existing Coke collection and search for items to start new ones. “We’d hit the major shows like Brimfield in Massachusetts and Round Top in Texas, plus we’d haunt the malls and flea markets,” Pat said. Coca-Cola items certain to strike a chord with collectors include a rare Coke Panama City seltzer bottle; a 10-piece set of Coke cooler glasses (10- and 16-ounce), like new and sealed in the box; a grill, also in like-new condition, about 21 inches tall and 15 ½ inches around, originally given to a Coke salesperson for having achieved a sales goal; a cardboard truck sign showing the best times of day to enjoy a Coke, measuring 56 ½ inches by 32 ¼ inches; a pair of mid-20th century Coke machines, both in good working condition and accepting nickels; Coke clocks and phones. Some items in the sale were inherited. For Sherry, that included the vintage hats and boxes, the linens and embroidery (all hand-made, in good condition), vintage tools and primitives. Pat, who grew up in Louisiana, inherited glassware and china, such as Roseville, Lusterware, Libbey, Chantilly, Regal Pastelle, Camelot American Rose, Castleton Rose, Aladdin Hollandia and more. Both ladies had an eye for advertising glasses. Their extensive collection includes glasses that promote Coke and Pepsi (the Pepsi character glasses depicting superheroes are highly collectible and are Pat’s favorites); Dr. Pepper, A&W Root Beer, Garfield, Pizza Hut, Godfather’s Pizza, Burger King, Hardee’s, Texaco and others. Also in the sale are kids’ toys from McDonald’s, spanning multiple eras, plus McDonald’s glasses, cups, advertising items and displays and more. Individual items of note will include a wooden barber’s chair made by Koken, quite old and ornately carved; a very rare Amish oak ice box with liners and metal shelving, made in Pennsylvania; a chalk figure of a bull from the 1939 New York World’s Fair; a doll’s bunkbed from Pat’s childhood; a vintage Singer sewing machine on a cast-iron treadle base, plus a New Home treadle base; a hand-made quilt on a quilt rack; and a sizable collection of player piano rolls, around 45 or so. Tobacciana items include cigarette making machines, ash trays and pipes. The kitchen collectibles include can and jar openers of every kind and vintage, various utensils, Post Toasties cups, vintage lunch boxes, Coca-Cola and other advertising dishes, small appliances (including a vintage toaster), old hand mixers (to include a vintage glass Keystone hand mixer showing measurements for flour, liquids, etc. ), butter dishes, advertising tins, Bakelite and more. The collection of phones can be broken into two categories. One is for the vintage black rotary phones (plus one green phone and one yellow phone) and a pay phone. The other is for the theme and novelty plastic phones for Coke, Pepsi, 7-Up, Mickey Mouse, Goofy, Rubik’s Cube, Garfield, Jeff Gordon, Heinz Ketchup and others. The ladies were nuts for Planter’s Peanuts memorabilia. Items to be sold will include a dart board, manuals, glasses, cups and advertising material. Their many clocks include examples advertising Garfield, Mickey Mouse, Snoopy, Coca-Cola, Dr. Pepper and others. Some of the clocks are lighted. The breweriana (beer and liquor collectibles) includes clocks, glasses, signs, some very popular small whiskey pitchers and more. Children’s items will feature toys and toy trucks, tea sets (to include one for Campbell’s Soup that’s mint in the package), Fisher-Price Playskool toys, Batman toys, vintage banks, two Radio Flyer red wagons (one wood, one metal), two taboggans, and a small vintage single pedestal oak desk. In addition, children’s books will also be auctioned. Also sold will be a wide assortment of collectible giveaways, from McDonald’s, Burger King, Disney, Ty and others, many still in the package. Also up for bid will be an old chicken coop once used for transport, several old gumball machines, military medals, scales (including a beautiful candy computing weigh scale with an attractive brass scoop, plus a standing scale that doubles as a fortune teller), a Geiser Bath Service round stool with a latch to secure the top with a metal shoeshine box, a cobbler’s lot (with a foot-stand, shoe stretcher and darners), a locking talking vendor floor-standing toy dispenser on a metal platform with a speaker and toys, and a handsome Zenith console cabinet phonograph with a broad array of vinyl records, to include Frank Sinatra on 78rpm, Elvis on 45 rpm and the Beatles on 33 rpm, plus many others. The sale will also feature a wooden petticoat dresser, wooden and glass washboards (some with advertising), nodders for prominent figures and brands, a vintage double postage machine, a vintage typewriter, perfume bottles, tennis rackets, a collection of miniature elephants, several Nestle modular counter racks (plastic table or wall displays), advertising displays (including a metal display for Tom’s Potato Chips, with a five-shelf collapsible rack), and elegant Depression glass pieces. The Specialists of the South, Inc. has been serving the Panama City community for more than 45 years. The company specializes in a broad range of services, to include estate auctions, furniture refurbishing, interior decoration, personal property appraisals and business liquidation services. It has been named the Small Business of the Month by the Bay County Chamber of Commerce. The Specialists of the South, Inc., is always accepting quality consignments for future sales. To consign an item, estate or collection, you may call them at (850) 785-2577, or you may e-mail them at [email protected] To learn more, or to register for the Sept. 22nd auction, log on to www.SpecialistsoftheSouth.com. Updates are posted frequently. The Specialists of the South, Inc.